COMAC Configuration Management Center established__Commercial Aircraft Corporation of China, Ltd.
COMAC Configuration Management Center was established on June 14th, 2018. 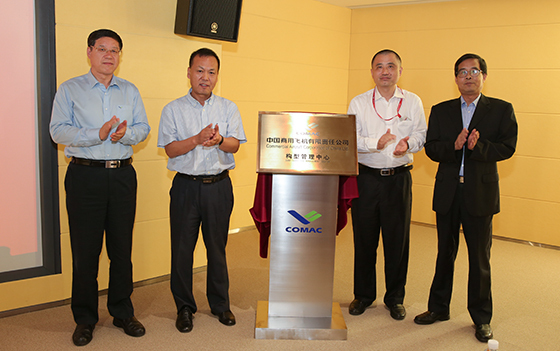 Configuration Management Center of Commercial Aircraft Corporation of China, Ltd. (COMAC) was established and unveiled on June 14th, 2018, aiming to further improve the company's configuration management system, unify product life-cycle configuration management rules, strengthen configuration management capacity building, and support the company's product development and program management. Mr. Zhao Yuerang, President of COMAC, Mr. Guo Bozhi, Vice President of COMAC, and Mr. Gu Xin, Director of Shanghai Aircraft Airworthiness Certification Center of CAAC, attended the unveiling ceremony and made a speech respectively. The Configuration Management Center, as an extension organization of the configuration management function of COMAC, is the responsible subject for the specific implementation of the company's configuration management business. It is responsible for supporting the system engineering department of the company to carry out the planning of product life-cycle configuration management, preparing and promoting the company's general procedures and methods related to configuration management, guiding and reviewing the specific implementation of configuration management business, and performing model configuration management.